Intended Use For Research Use Only. Not for use in diagnostic procedures. For Research Use Only in the United States. 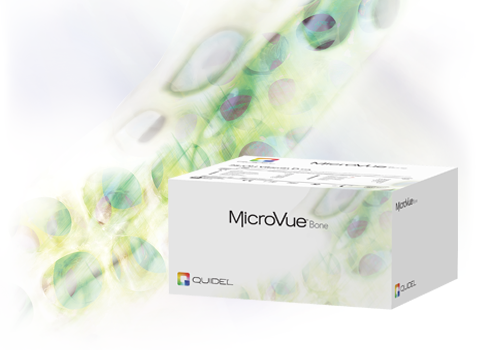 MicroVue Serum PYD provides a quantitative measure of the excretion of pyridinoline cross-link (Pyd) in serum. Pyridinoline cross-links are an indicator of type I collagen resorption, especially bone collagen. In humans, the total pool of urinary Pyd is approximately 45% free while the remaining fraction is bound to oligopeptides ranging from small linear peptides to very large cross-linked structures in excess of 10,000 Da. The proportion of free to total cross-links appears to be constant in healthy individuals and those with metabolic bone diseases or arthritis conditions, thus providing the rationale for measuring free Pyd. Krupski W, Tatara MR, Bury P, et al. Negative Effects of Total Gastrectomy on Bone Tissue Metabolism and Volumetric Bone Mineral Density (vBMD) of Lumbar Spine in 1-Year Study in Men. Cuce. G, ed. Medicine. 2016;95(7):e2817. Xiong L., Xia W.-F., Tang F.-L., Pan J.-X., Mei L., Xiong W.-C. Retromer in Osteoblasts Interacts With Protein Phosphatase 1 Regulator Subunit 14C, Terminates Parathyroid Hormone’s Signaling, and Promotes Its Catabolic Response. EBioMedicine. 2016;9:45–60. A. Lamora, M. Mullard, J. Amiaud et al., “Anticancer activity of halofuginone in a preclinical model of osteosarcoma: inhibition of tumor growth and lung metastases,” Oncotarget, vol. 6, no. 16, pp. 14413–14427, 2015. Karolina Sieroń-Stołtny, Łukasz Teister, Grzegorz Cieślar, et al., “The Influence of Electromagnetic Radiation Generated by a Mobile Phone on the Skeletal System of Rats,” BioMed Research International, vol. 2015, Article ID 896019, 11 pages, 2015. Decaris ML, Gatmaitan M, FlorCruz S, et al. Proteomic Analysis of Altered Extracellular Matrix Turnover in Bleomycin-induced Pulmonary Fibrosis. Molecular & Cellular Proteomics : MCP. 2014;13(7):1741-1752. Huang Y, Zhao JX, Yan X, Zhu MJ, Long NM, et al. (2012) Maternal Obesity Enhances Collagen Accumulation and Cross-Linking in Skeletal Muscle of Ovine Offspring. PLOS ONE 7(2): e31691.